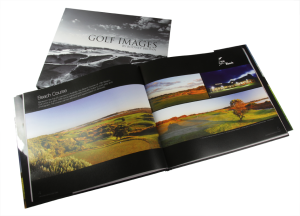 Wouldn’t it be great if you could put all the wonderful photos of your golf course into a hard cover book for all your members and their guests to enjoy? 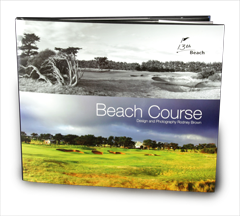 Well you can, Golf Images can create beautifully finished coffee table books that won’t cost you thousands of dollars. With the combination of wonderful photography and stylish design your golf club can produce their own personalised coffee table book. Whether Rodney takes the photos for you or you supply what you already have, a book showcasing every hole on your course will be a fabulous addition to your golf club. For members and their guests to enjoy. To show before and after shots of a course redesigned or upgraded. A coffee table book is more then a photo album, the mixture of text and diagrams can really add to the story telling. Your book will capture the essence of your club. Sell it to your members and guests through your pro shop. You can order one book at a time. Hard Cover: Black linen made of 100% cotton treated with water-based acrylic for extra resiliency. Dust Jacket: Includes laminated full colour dust jackets with front and back flaps and printing on the spine. Turn Around: To print the book takes 4 to 5 weeks. Design includes the artwork production of the book. You will received a PDF of the book for approval before the book is printed. Print Runs over 5 copies saves 5%, 10 – 49 saves 10%. Please note the artwork is a once off cost, once completed you can order the book through Golf Images as many times you like for the cost of the printing. 50% of total cost of project is required before the project can start. Download a PDF of the 13th Beach Coffee Book and have a closer look at the design.